Especially in job interviews. Their answer tells you a lot about their motivation for approaching problems and achieving goals. I've probably asked this over 200 times. Naturally, I've also thought about my own answer for a while. I figured the best way to know, is to go out and do it. I set my sights on Mount Washington. The first time I was at the top of Mt Washington we had perfect weather; 60 degrees and not a cloud in the sky. The guy running the gift shop told me they see maybe 3 days a year like that. For a place that's famous for having the worst weather in the world, I was unimpressed. Perfect weather makes for boring pictures. I wanted to see Mt Washington at its worst. Or, at least when it's pretty angry. The mountain did not disappoint. 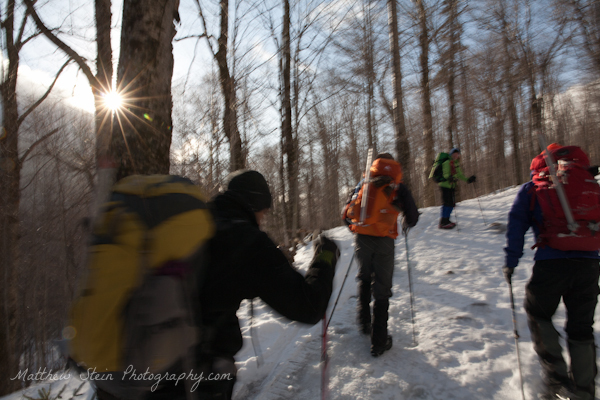 With a few friends, we booked a guided trip through North East Mountaineering. 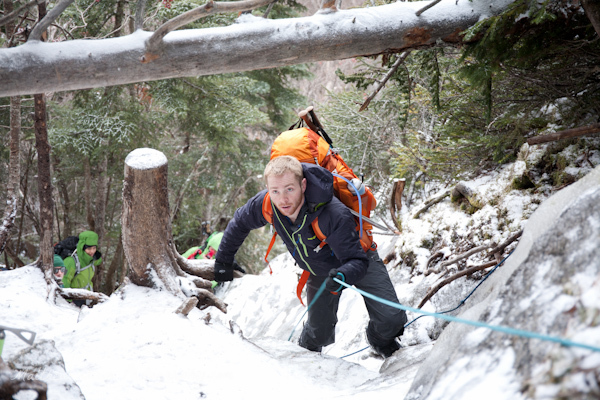 Since this was my first time in crampons, I wanted to ascend the alpine learning curve as quickly as possible. The day before our climb, it rained. 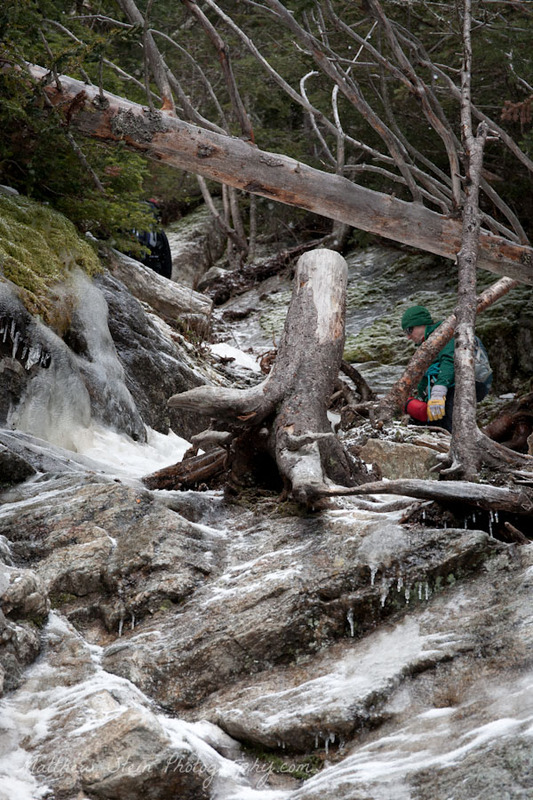 Much of the ice and snow melted away, leaving thin cover for our ice axes and crampons. Overnight, the weather grew colder and froze over. At the top, thin snow required careful footwork and the ice covered rocks, roots and trees below made for tricky technical climbing. We climbed up Lion Head trail, crossed the Alpine Garden and finally got to the feature of Lion Head itself. Just 0.9 miles from the summit, we faced the full force of the hurricane strength winds that day. The weather report called for sustained winds at 80-90 mph, gusts over 100 and light snow most of the day. Fortunately, my cameras are built to survive this kind of weather. Both my GoPro and my 5d are well weather sealed. I rented a 24-70mm f/4 from LensProToGo. The f/4 saves 200 grams over the f/2.8 and I didn't need the extra stops. GoPro's are great, but battery life is always a concern in the cold. I had no problems with two batteries, alternating to keep them warm in my pockets. We didn't make the summit this time. At the top of Lion Head our group took a few minutes to look around, take souvenir photos, and realize how far we came. Barely able to stand straight in the wind, Mount Washington reminded me how small and fragile we are, and how thin the margin for survival is. With the right preparation, and a bit of luck, you can make it to the top. So, why do people climb mountains? I changed my answer after this climb and reading The Freedom of the Hills. I climb to appreciate the mountain. Thin ice on the Hillary Steps. Jeff heading up the Hillary Steps. 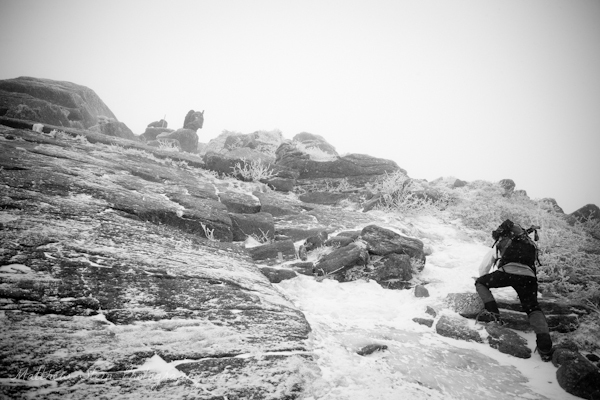 See the rest of my Mount Washington Climb set on flickr.